Street View is finally ready for its closeup. Earlier this week, Google announced a new certification program for 360-degree cameras, letting anyone shoot and upload their interactive experiences right to Maps. And now, Google is looking to use those images and videos to help get you from point A to point B. The next time you go to start a new drive, you’ll notice something a little different about your route. A new tweak to the Google Maps interface puts a greater emphasis on Street View, showing small pictures of each turn alongside the description, where available. When you tap one of the thumbnails, you’ll get a full view of the scene, with a route marker indicating where to turn or what to do. Also new to Google Maps is an even smaller change to the navigation. The bottom navigation bar has been tweaked. As seen above, most screens now include the standard Android navigation bar and added new explicit buttons to take you to different screens. It’s a matter of taste, but personally, we liked it better the old way. The changes appear to be server-side ones that aren’t tied to a specific update, but if you aren’t seeing them, you can try side-loading the latest Google-signed APK of Google Maps from APK Mirror. The new Street View images aren’t active in the iOS app yet. 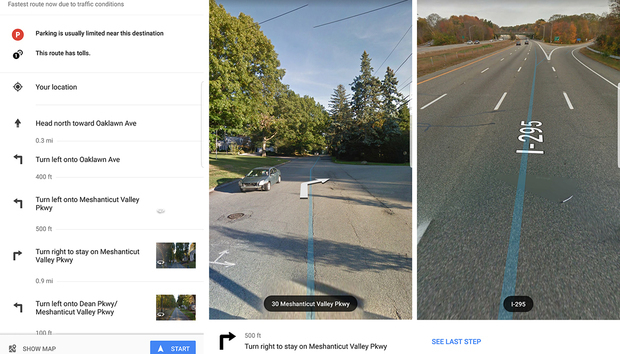 The impact on you on the road: The addition of Street View pictures is a small change and one most people aren’t likely to notice, but it could be the start of a greater emphasis on real-world mapping. Google Maps is far and away the best navigation app on our phones, but being able to traverse more of the world with actual imagery would truly put it in a class by itself.